I spotted Princeton Police Chief Nick Sutter and two of his officers Detective Adam Basatemur and Detective Sergeant Ben Gering in Hamilton Township last week in the midst of a shoot – with cameras, not guns, pointed at them. They were among the 13 police officers taking part in a celebratory, rather than crisis, situation, during which the officers listened to words of appreciation for their acts of selfless bravery. L-R: Princeton Police Detective Adam Basatemur, Princeton Police Chief Nick Sutter, Princeton Police Detective Sergeant Ben Gering. 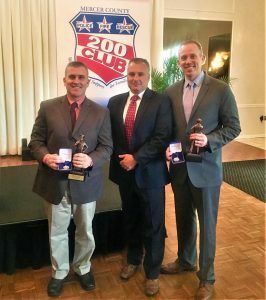 An estimated 210 guests attended The 200 Club of Mercer County’s Annual Luncheon on Wednesday, June 13, at the Stone Terrace in Hamilton Square to pay tribute to the law enforcement officers being honored for their bravery, skills, character, determination, and unwavering commitment to the health and well being of the county’s citizens. The particular incident that inspired the honor for the Princeton detectives, along with two other law enforcement colleagues NJ State Police Lieutenant Tom Wieczerak and New Jersey State Police Sergeant Joe Itri, remains an engraved image on my psyche, because it occurred a little too close for my comfort. It took place a block from where I live, right next to my favorite institutional hangout – the Princeton Public Library, and a block away from Starbucks and Small World Coffee, where I derive all of my sustenance. As described by Princeton Police Chief Nick Sutter, on the evening of January 24th, 2018, Princeton Police Department Detective Sergeant Ben Gering and Detective Adam Basatemur located a vehicle belonging to a suspect wanted in connection with a homicide in New York. The vehicle was parked on the top level of a downtown Princeton parking garage. The search of the area began in response to an alert sent by the New Jersey State Police. As the detectives approached the car to investigate, a male, identified as the wanted suspect suddenly ran from the car and jumped up on the parking garage wall, five stories above ground level. The officers made contact with the suspect who was now in a crouched position on the wall of the parking garage ready to jump. They began to negotiate with the suspect, when New Jersey State Police Lieutenant Tom Wieczerak and Detective Sergeant Joe Itri arrived and assisted in the negotiations. After an hour of negotiations in frigid temperatures, they eventually convinced the suspect to come down from the ledge. They continued to negotiate with the suspect in an attempt to get his surrender peacefully. As negotiations broke down, Sergeant Itri was able to take the suspect to the ground, in order to prevent him from fleeing or harming himself. The detectives and troopers took the suspect into custody. This suspect was wanted for a “particularly heinous murder. If not for the actions of these officers and troopers, this individual may still be in the community or he may have successfully committed suicide,” said Chief Sutter. The 200 Club of Mercer County every year presents The R. Peter Hodge Valor Award to an individual who has committed an act of bravery, beyond the call of duty, and at imminent personal risk to his/her own life and safety. The club named the award in honor of its late founding board member Princeton resident Peter Hodge, renowned for a life devoted to helping others and for “his dedication and support of all first responders in our community….These honorees on the scene at these incidents, like so many safety and rescue personnel, put their own lives in danger to protect others,” said Greg Blair, president of the 200 Club of Mercer County. Nearly 40 years ago, The 200 Club of Mercer County, which costs $200 to join, was founded to provide financial assistance to the families of public safety and rescue personnel who have lost their lives in the line of duty. This includes the police officers (state, county, and municipal), correction officers, fire fighters, and rescue squad technicians of Mercer County. Crucial to its mission is the celebration of those first responders who have exhibited extraordinary courage and bravery under difficult or hazardous conditions. This year seven police officers received the R. Peter Hodge Valor Award, and six members of the Mercer County Special Task Force received a special recognition. Keynote speaker at the lunch was renowned Princeton resident – New Jersey radio (NJ101.5 FM), television (FOX TV affiliates), and comedy club personality Bill Spadea. In addition to the police officers involved in the Princeton incident, the other recipients of the 2018 Valor Awards were: Trenton Police Officer Freddy Jimenez; NJ state Police Detective Rasheed Joaquin; and NJ State Police Sergeant Curtis Sand. The 200 Club also presented a Special Recognition Award to the six officers of the Mercer County Task Force, who met gunfire, when they attempted to serve an arrest warrant – situation that led to a dramatic and life-threatening 36-hour standoff. The officers involved were: Mercer County Prosecutor’s Office Detective Anthony Abarno; NJ State Parole Board Officers Timothy Healy and Barry Volkert; Sheriff’s Detectives William Perez, Joseph Tuccillo and Steven Niederer. For more information about the 200 Club of Mercer County, to join as a member, make a donation, or volunteer to help implement its mission, please visit www.mercer200club.org or call 609-498-7727.